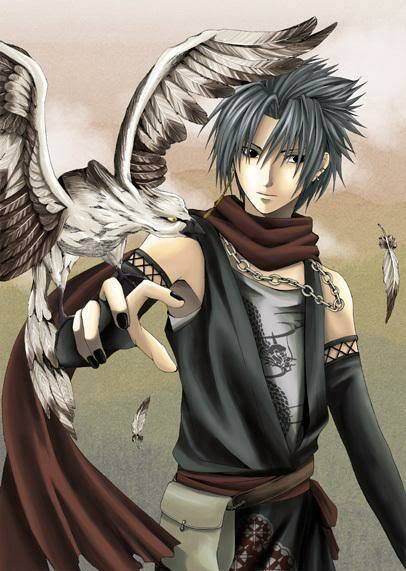 Shadow walks out to the lake, admiring the strange white color, reminding him of his own odd appearance. He shrugs it off, walking to the very edge of the lake. He closes his eyes, feeling the flows of chakra around him off things. He can see the chakra of the lake, which as the water had made, was constantly shifting, making it hard to come up with an exact amount to use. Could have been worse I suppose. I wonder what will happen when I get out farther and mess up....I'll have to swim back or...yeah, I'll try that if it comes down to it. He thinks to himself. He channels his chakra yet again, moving out at the water's edge. He sets his foot down on it, and loses focus almost immediately, his foot sinking down before he jerks it back up. Gah, not paying enough attention. Come on Shadow...you have to really focus for this! He thinks, pumping himself up. Just as he goes to take another step, the water's chakra under his foot still on the water shifts suddenly, and he slips into the water, it soaking him past his knees this time, not quite to his waist though. He grunts and sloshes back up to the shore, walking out onto the land and shaking his legs off yet again. I know I can do this! My clan is supposed to have great chakra control, I just...I need to focus more, I need something to focus on I think. He thinks. He shakes it off and continues his training. He focuses again on the lake’s chakra. He sits there for several minutes, just studying the water’s chakra over and over again. After the watching he sees that the chakra patterns repeat, and change as it moves out over the lake. He watches the flow a little longer, just to make sure he isn’t making some kind of mistake. He nods to himself as he finishes watching, then makes a hand seal. He focuses chakra to his feet and begins walking forward. His first foot steps on the lake with no problem. He takes another step, the water rippling out as his feet touch down. Standing there, he makes sure to keep the charka to his feet moving in the same pattern as the lake over and over again, making sure that he can keep it going before going any farther, starting to sweat from the continual strain of channeling chakra at this rate. He begins walking again. I can do this. I know I can do this, I just have to maintain the same pattern and focus and I’ll be fine. He thinks to himself as he continues. He takes two more steps, the water rippling and shivering as he steps down each time, the ripples moving across until they die out. Shadow awakens after a long rest. He opens his eyes, looking up towards the sky. The sun is getting closer and closer to the horizon. Man...only an hour or so of sunlight left. Well, I had better make the best of my training. He thinks. He stands up a bit shakily, but easy enough. He shakes off his weariness and focuses himself. He ignores all the fatigue of his body and what not, and feels at his chakra reserves. Hmmm, I've got a decent amount back from resting. I should be able to train for the next hour or so. He thinks confidently. He closes his eyes and focuses on the lake's chakra. The pattern has changed slightly, but he quickly goes about memorizing every detail of it. He moves forward, making a hand seal and channeling chakra to his feet. His first few steps touch the water perfectly, with no problems, ripples flowing away from his feet. He takes a few more steps, then pauses, having to focus on maintaining his steady and correct flow of chakra. He wobbles for a moment, but manages to keep his focus and chakra flow just right. He continues walking, very slowly now, trying to make sure his chakra flow is moving at the same pace as the water's. He stops...not knowing how far out he is, but he is really at least 40 feet from the shore now. He is inching closer and closer to the island in the middle of the lake, unknown to him though. He has now been focused like this for at least 10 minutes, the strain starting to show on his body. Sweat begins beading up again and dripping off his face. He stops, panting slightly, but not letting his mind stray from focusing on his chakra flow and the lake's. He takes some more steps, each step getting harder and harder to maintain his focus. The water's chakra flow shifts, and he almost slips under, but just barely manages to change his chakra flow to match in time. He struggles, taking several more strained steps. The steps themselves are easy, but the strain on his mind from focusing the chakra to the same place over and over in a certain flow is tiring him greatly. He is now very close to the island, and he can, like seeing it out of the corner of your eyes, see the chakra of the island. He puts all his focus into his feet, thinking of absolutely nothing else, sweat drenching him now. He focuses as hard as possible, putting the most precise amount of chakra possible to his feet. Without even realizing it, he takes a step onto the soft grass of the small island. The surprise makes him lose his focus, and he falls face first to the ground, landing in the plush grass. He chuckles softly to himself, Heh...I...did it... He says weakly as he blacks out and drifts off into a deep sleep, the water from the lakes flowing up to his ankles. Shadow wakes up early the next morning, the sun rising just up over the trees in the area. Laying on the grass, his feet and ankles soaked through to the skin from having the lake's water wash up on them, he looks up at the sky, still able to see some stars dotting the sky here and there. He sits up slowly, testing his body as he does so. Well, it seems like I'm almost up to full again. He says to himself. About that time, a loud rumble comes from his stomach, which starts twisting and turning. He grabs his stomach, Oh man, it's been almost a full day since I ate anything. I better get back to the village and eat. I've pretty much got what I was trying down anyway. He says to himself. He stands up all the way, a bit wobbly, but good to go still for the time. Well, I guess I'll have to walk back across the lake. I suppose I could memorize a set pattern of water and run straight across...that might work, or I hope it does. I don't think I'd be able to swim that far then have to walk to town, and jumping that far is out of the question. He thinks to himself. He does a bit of stretching, then closes his eyes, looking across the lake towards the shore. He looks down a straight line towards the shore, memorizing the chakra pattern and judging his own speed. He makes a set pattern and calculates how long it will take to get to each place and how often he has to wait to change his own chakra flow. He channels chakra to his feet, and focuses hard on the set pattern he made for himself. He takes a breath and takes off across the lake at full speed. He keeps focus on his feet and and keeps a continous flow of shifting chakra in his feet that matches each part of the water that he saw. After running for a short bit, he gets fairly close to the shore. Instead of worrying about keeping his balance and staying above water while running, he goes ahead and takes a running leap for the shore. He goes flying through the air, and hits the ground, rolling forward to stop his momentum. He lays flat out on the ground as the roll stops, panting slightly. Wow, that was a bit harder than I thought it was going to be. No way I could pull something like that off in battle for any long period of time. Maybe land on the water at best, no way I could move around on the water like that. He says to himself. He stands up and starts walking towards the village. As he is walking, there is a sharp pain directly in the center of his forehead. He stops and hisses, his hands moving up over his forehead. He closes his eyes, the pain so sharp, feeling like it is going on forever. In reality, the sharp pain only lasts for a couple seconds. He opens his eyes and shakes off the pain. What the hell was that? He thinks to himself. He shrugs it off as mental stress from the training, and continues on to the village. do i Spend My 25,000 SkillPoints to My Jutsu or My Stats ???????? i'll add somethin like chunin could have c ranks and jounin b etc. Subject: Re: Futhering Chakra Control!!!! !